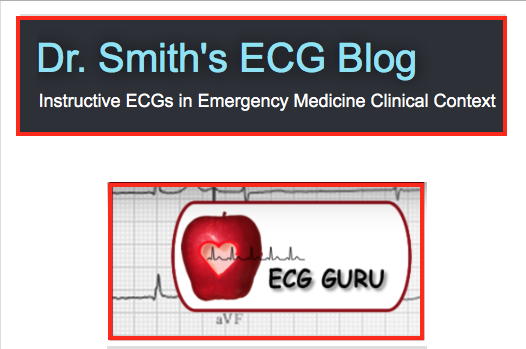 This is my 7th installment of Basic ECG Concepts. 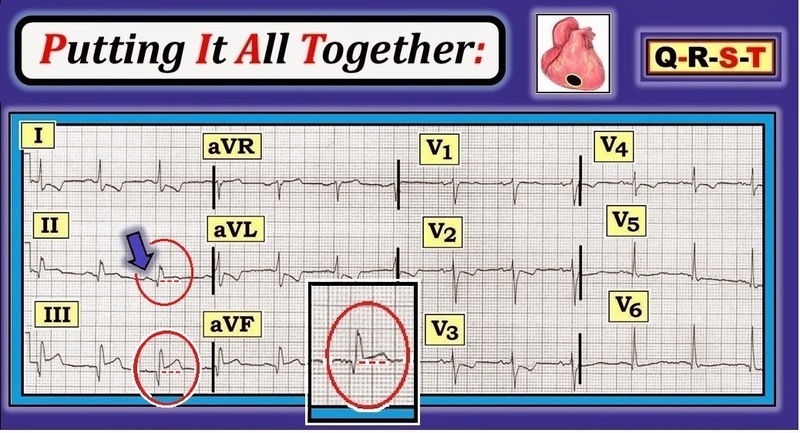 Rather than specific cases — the goal of these Basic ECG Concepts is concise review of some less advanced topics that comprise the fundamentals of ECG interpretation. 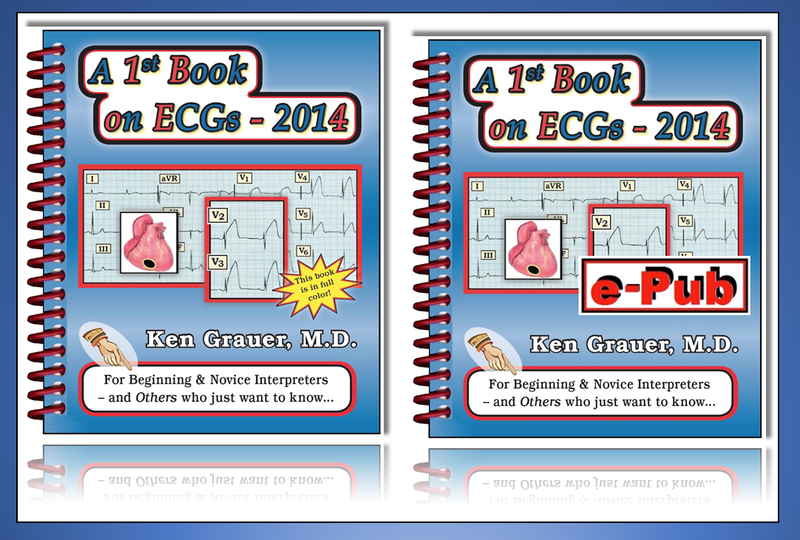 This material is excerpted with modification from my new introductory book to ECG Interpretation = “A 1st Book on ECGs-2014” and/or the expanded 1st-ECG-Book-ePub version. Your feedback on this series is WELCOME! NOTE: To enhance relevance — some advanced points have been added illustrating clinical application (with this more advanced material excerpted from our ECG-2014-ePub). 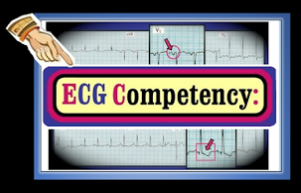 In this way — We hope this post is of interest and value to ECG interpreters of any level. Having presented our step-by-step Systematic Approach in Basic ECG Concepts #6 — We now focus attention on the important 6th Parameter of our Descriptive Analysis = assessment of Q-R-S-T Changes. In many ways, evaluation of this Parameter embodies the essence of clinical ECG interpretation — in that it provides information regarding the likelihood of acute ischemia/infarction (vs the presence of other conditions that produce ST-T wave changes). It may also provide insight to the presence and severity of metabolic disorders. Our reason for delaying assessment of Q-R-S-T Changes until the end of the Systematic Approach (ie, until after assessment of Rate, Rhythm, Intervals, Axis and Chamber Enlargement — as in Figure-1) — is that criteria for ischemia/infarction will be different IF the QRS Interval is prolonged and/or the patient has bundle branch block. How we interpret ST-T wave changes may also be affected by the rate and rhythm, and whether or not LVH or RVH is present. CAVEAT: Our purpose in using “Q-R-S-T” as a memory aid — is so that nothing is forgotten during the process of systematic assessment. The most commonly overlooked feature — is the presence of a predominant R wave in lead V1 and/or early transition or presence of an rsr’ complex in lead V1. Routine inclusion of “Q-R-S-T” in your assessment automatically reminds you to consciously evaluate the “R” component = normality of precordial lead evolution. Figure-1: The 6 Parameters in the Descriptive Analysis step of our Systematic Approach to ECG interpretation. 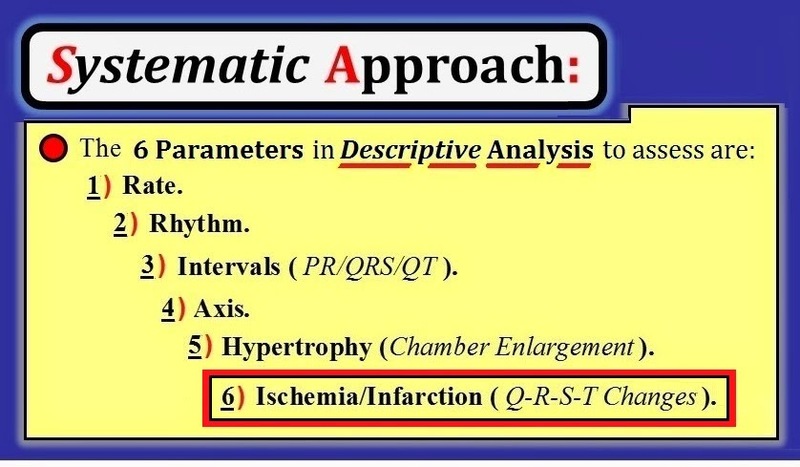 The reason we assess Q-R-S-T Changes last (as the 6th Parameter) — is that criteria for ischemia/infarction may change if there are abnormalities in any of the preceding 5 Parameters. 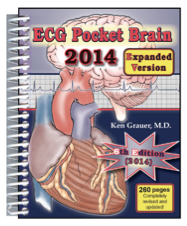 (Figure reproduced from A 1st Book on ECGs-2014-ePub). NOTE — Enlarge by clicking on Figures — Right-Click to open in a separate window. 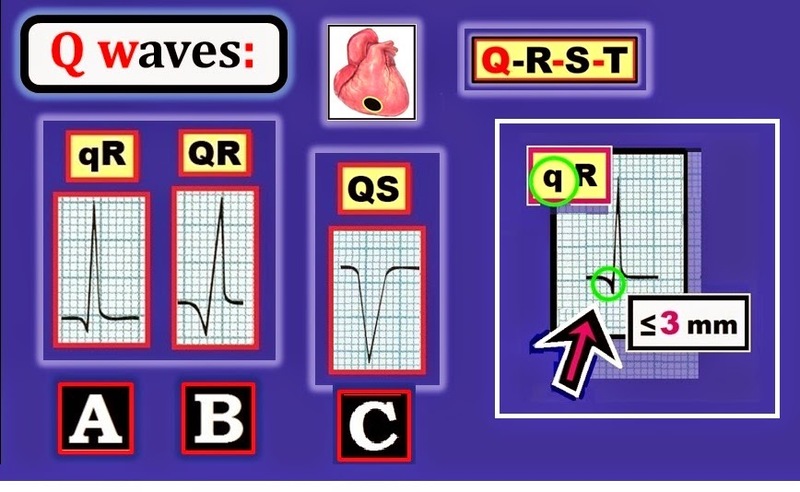 In Basic ECG Concepts #1 — We defined a Q wave as the 1st downward deflection of the QRS complex. We then refined our classification by use of large or small-case letters — depending on whether the Q wave was wide and at least 3 mm (= 3 little boxes) deep. These features are illustrated in Figure-2. Small and narrow Q Waves (as seen in Panel A of Figure-2) — are often normally seen in healthy subjects. This is particularly true when such small and narrow q waves are present in one or more of the lateral leads (leads I, aVL; V4,V5,V6) — especially if the clinical scenario and the rest of the ECG appears to be benign. In contrast — large and wide Q Waves (as seen in Panel B) — are much more likely to indicate that at some point there has been an MI (Myocardial Infarction). The larger and wider the Q waves are — and the more leads in which they are seen — the more likely it becomes that they indicate prior MI. Advanced Point: Be aware of a 3rd possibility regarding Q waves — in which an all-negative complex is seen (Panel C). Because there is no positive deflection (ie, no R wave) — We are unable to tell if the all-negative deflection that is seen is: i) a Q wave; ii) an S wave; or iii) some combination of the two. As a “compromise” — this pattern is called a QS complex (as seen in Panel C). Clinically — a QS pattern is most commonly seen in one or more of the anterior leads. Depending on other parameters (such as QRS complex width and ST-T wave appearance) — clinical implications of a QS pattern may be similar to clinical implications of a wide Q wave (= possible previous infarction) — especially if QS complexes are seen in multiple leads. On the other hand — the presence of one or more QS complexes may be a normal finding (See discussion of Figure-5 below). NOTE: All bets are off (! 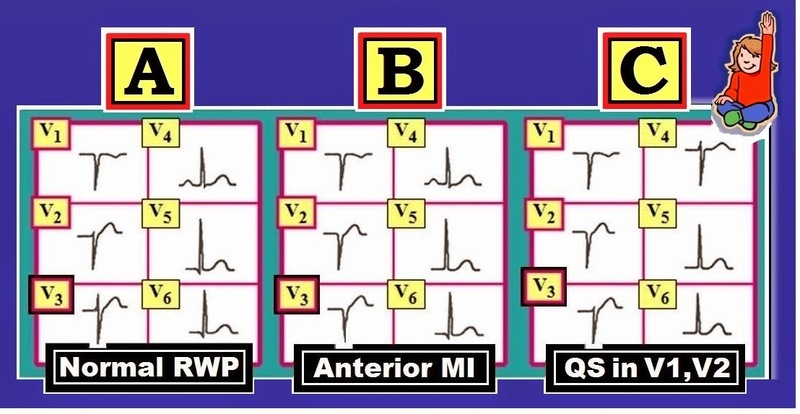 )— IF QS complexes are seen in a patient with QRS widening from LBBB (Left Bundle Branch Block). In this situation — anterior QS complexes are not only common, but an expected accompaniment of LBBB (See Figure-3 in Basic ECG Concepts #6). Figure-2: Types of Q waves. In Panel A — the q wave is small and narrow (clearly not more than 3 mm in depth). Q waves this small and narrow are less likely to indicate prior infarction. In contrast — the Q wave in Panel B is much wider and deeper. The wider and deeper a Q wave is — and the more leads in which they are seen — the more likely it becomes that such Q waves indicate prior MI. Finally, in Panel C — there is a QS pattern (because the QRS complex is all negative without any positive deflection). Clinically — a QS complex may or may not indicate prior infarction. 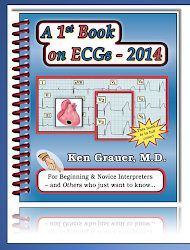 (Figure reproduced from A 1st Book on ECGs-2014-ePub). Clinical NOTES: Even when large and wide Q waves indicate that prior infarction has taken place (as would be suggested by Panel B) — the mere presence of such Q waves does not tell us anything about the “age” of the infarct (ie, whether it occurred years ago — or fairly recently). To determine IF an MI might be “acute” (ie, beginning within the past few hours — and possibly still ongoing) — We use a combination of: i) History (ie, Is there new-onset chest pain? — or — Is chest discomfort more of a longterm problem without recent onset? ); ii) Assessment of ST-T wave changes on serial ECGs (as will be discussed momentarily); iii) Blood tests, such as cardiac troponin assays — that within hours show progressively increasing troponin levels roughly correlating with the amount of cardiac damage; and on occasion, iv) Use of other tests (which may include an Echocardiogram at the bedside looking for abnormal heart wall movement — or — cardiac catheterization to look for an acutely occluded major coronary vessel). Advanced Points = CAVEATS: Although deep and wide Q waves often serve as a “marker” of prior infarction — this ECG sign is not without exceptions. Certain conditions (ie, cardiomyopathy) may produce Q waves not due to infarction (See ECG Blog #45). Further complicating assessment of Q waves on ECG — is the clinical reality that infarction-related Q waves do not always persist after the event. With time — Q waves may either decrease in size or disappear entirely. As a result — even small q waves may at times be a “marker” of prior infarction (ie, if a previously large infarction-Q-wave shrunk in size but did not disappear). Awareness of the clinical history and what the patient’s baseline ECG looked like would be needed to know if persistent small q waves in that patient were serving as a marker of prior infarction (assuming lead placement issues and a shift in axis were not the reasons for change in Q wave morphology). Q-R-S-T Changes: Assessing “R Wave Progression"
Initially in right-sided lead V1 — the QRS is predominantly negative (an rS complex). This is because lead V1 sees most of the heart’s electrical activity as moving away from the right as the much larger and thicker LV (Left Ventricle) is depolarized. Note how the R Wave “progresses” — by getting taller as one moves from leads V1 and V2 toward left-sided leads V5 and V6. In general — R wave amplitude “tops out” by lead V5, and then becomes smaller in lead V6. This is the situation in Figure-3 — although many variations on this pattern of R wave progression are possible. We define the point of “Transition” — as the place where the R wave becomes taller than the S wave is deep (highlighted by the green arrow in Figure-3). Normally — transition occurs between leads V2-to-V4. It occurs between lead V3-to-V4 in Figure-3. Figure-3: Schematic blow-up cross-section of the heart. Precordial lead placement of recording electrodes is suggested by the yellow ovals. Note our focus on the predominant direction of the heart’s electrical activity during ventricular depolarization (red arrow) — and the effect this has on progression of R wave amplitude in the precordial (chest) leads. Initially (ie, in leads V1,V2) — there is a predominant S wave (negative deflection) — because most of the heart’s electrical activity is moving away from these right-sided leads. As one moves across the chest — the R wave becomes taller until the point of transition is reached where the R wave becomes taller than the S wave is deep (green arrow). This occurs between lead V3-to-V4 in this Figure (Transition normally occurs somewhere between lead V2-to-V4). (Figure adapted from A 1st Book on ECGs-2014-ePub). Septal Depolarization: The final point illustrated in schematic Figure-3 — is the effect septal depolarization may have on the ECG. After the Sinus-Node-conducted impulse leaves the AV Node — the very first part of the ventricles to be depolarized is the left side of the interventricular septum. As a result — septal activation normally proceeds from left-to-right (small blue arrow in Figure-3). Because septal activation normally moves toward right-sided lead V1 — there will often be a small initial r wave (positive deflection) in lead V1 as well as in lead V2 (as is seen in these leads in Figure-3). This small initial r wave may be lost when there is septal infarction. 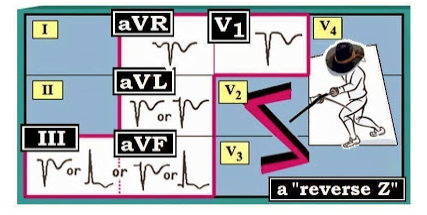 At the same time — septal activation normally moves away from left-sided leads V5,V6. As a result — one or more lateral leads (ie, leads I,aVL; V4,V5,V6) will often manifest a small initial q wave (negative deflection) simply as a reflection of normal septal activation. As discussed in explanation to Figure-2 — lateral q waves are unlikely to indicate prior infarction IF: i) these q waves are small and narrow; and ii) the clinical scenario and the rest of the ECG appears to be benign. TEST YOURSELF: Where is the Point of Transition? Look at the 3 schematic precordial lead sequences in Panels A, B and C of Figure-4. Comment on R wave progression in each of these sequences. In each case — Indicate the 2 leads between which Transition occurs. What do you think is meant by the term, “late” Transition? Figure-4: Identify the point of Transition for the 3 precordial lead sequences shown in this Figure. What is meant by the term, “late” Transition? 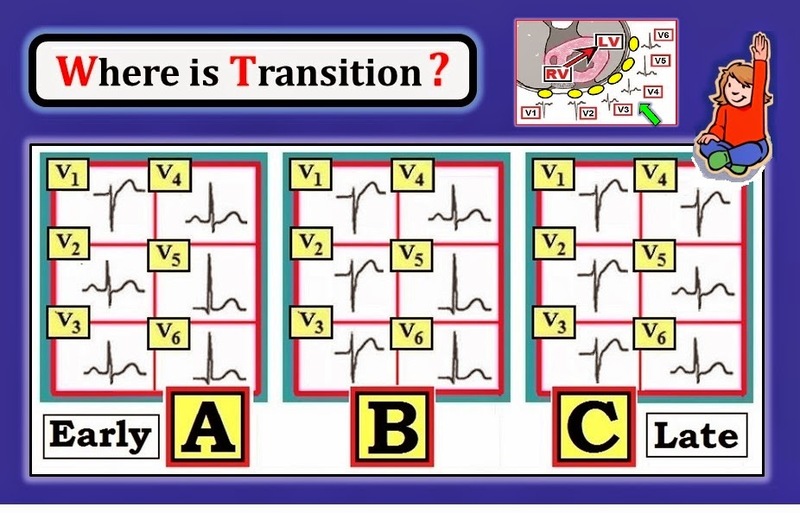 HINT: Transition normally occurs somewhere between lead V2-to-V4 (Figure reproduced from A 1st Book on ECGs-2014-ePub). ANSWER to Figure-4: The R wave “progresses” in each of the 3 sequences shown in this Figure. By this we mean that R wave amplitude is smallest in lead V1 — and then gets taller as one moves to the next precordial leads. Normal Transition occurs in Panel B. That is — the R wave becomes taller than the S wave is deep between lead V3-to-V4. In Panel A — there is “early” Transition. By this we mean that the R wave becomes taller than the S wave is deep before the normal point of transition. Specifically — Transition in Panel A occurs between V1-to-V2. In Panel C — there is “late” Transition. That is, the R wave becomes taller than the S wave is deep after the normal point of transition. Specifically — Transition in Panel C occurs between V4-to-V5. Putting It Together: Assessing “R Wave Progression"
Insight into the clinical utility of routinely assessing the “R” component in the “Q-R-S-T” parameter is forthcoming from review of Figure-5. Panel A in Figure-5 — shows normal R wave progression. Note progressive increase in R wave amplitude across successive precordial leads until the R wave “tops out” in lead V5. Transition is normal in Panel A (occurs between lead V3-to-V4). FINE Points: Although a QS complex is present in lead V1 — this is unlikely to reflect prior septal infarction because the QS complex is limited to lead V1 (ie, an r wave develops by lead V2 in Panel A). The small and narrow q waves in leads V5,V6 almost certainly represent normal septal q waves. They are unlikely to indicate prior infarction — because of their small size and expected lateral location. In contrast — anterior infarction is suggested by the precordial lead sequence in Panel B. This is because a QS complex is seen not only in leads V1,V2 — but also in lead V3. FINE Points: We can more specifically qualify location of the infarct in Panel B as being “antero-septal” — because there is loss of the initial r wave in leads V1,V2. Note that despite the QS in V1-thru-V3 — transition is still “normal” (occurs between lead V3-to-V4). Finally — the isolated small and narrow q wave in lead V6 of Panel B is unrelated to the anterior infarction and almost certainly once again reflects a normal septal q wave. In contrast, in Panel C — a QS pattern is seen in both lead V1 and V2, but not in lead V3. That is — a small-but-definite initial positive deflection (r wave) is seen in lead V3. The finding of a QS complex in V1,V2 but not in V3 — may or may not be a “normal” finding. Instead, it could indicate: i) a technical lead placement error; ii) septal infarction; or iii) a normal variant. Since there may not be any reliable way to distinguish between normal variant vs lead placement error vs prior septal infarction — We simply acknowledge, “QS in V1,V2; Suggest clinical correlation” in our interpretation. FINE Points: Statistical odds are far greater (approximately 4-to-1) that either normal variant or lead placement error rather than septal infarction are the reason for a QS complex in V1,V2 but not V3 (as seen in Panel C). 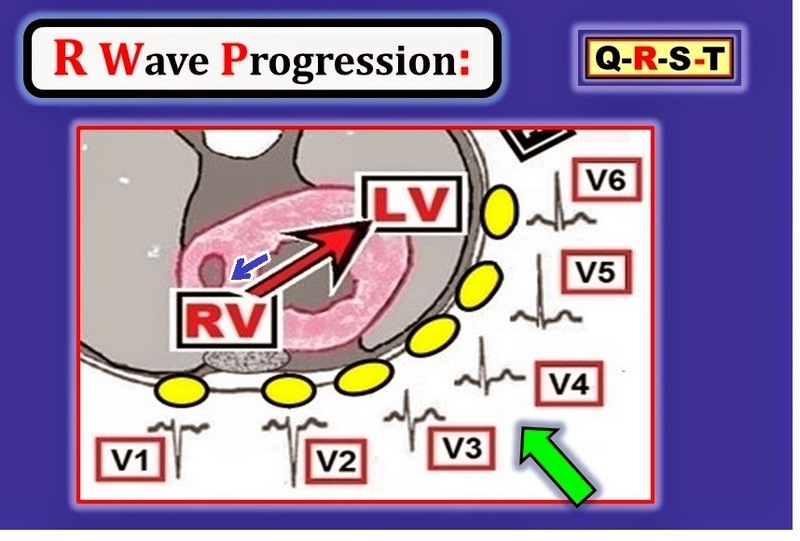 Figure-5: Normal RWP (R Wave Progression) is seen in Panel A. This is in comparison with precordial lead sequences suggestive of anterior MI (Panel B) vs an indeterminate pattern showing a QS complex in leads V1,V2 but not in V3 (Panel C). 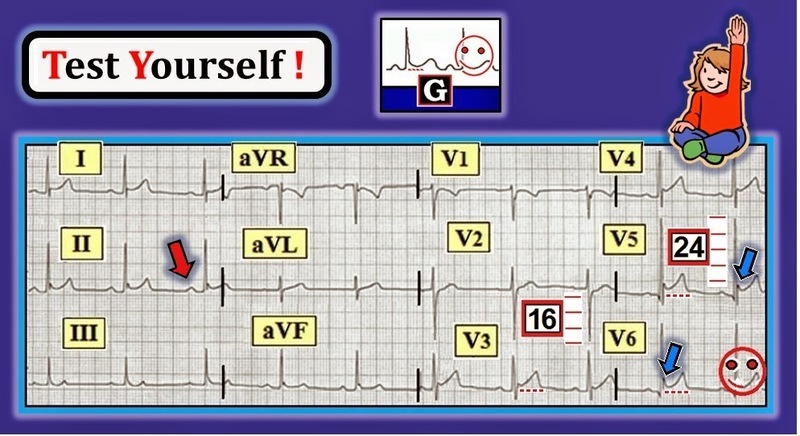 (Figure adapted from ECG-2014-ePub). Advanced NOTE-1: The above comments regarding clinical implications of a QS complex in leads V1,V2,V3 hold true only when the QRS complex is narrow. As we have already noted — QRS widening due to LBBB commonly produces QS complexes in anterior leads that are simply the result of the conduction defection and are not indicative of anterior infarction (See Figure-3 in Basic ECG Concepts #6). Advanced NOTE-2: There are at least 3 other common reasons for PRWP (Poor R Wave Progression) with a narrow QRS complex that are not the result of prior infarction. These are: i) LVH; ii) LAHB; and iii) Severe pulmonary disease/COPD. Usually at least some r wave will be seen by lead V3 with these other conditions — though not always. Bottom Line: It is sometimes extremely difficult to know with certainty the cause of PRWP when R waves in leads V1,V2,V3 are either very small or absent. Clinical correlation is essential. Beyond-the-Core: It is insightful to appreciate the physiologic reason why R wave progression is often “poor” in the presence of these other conditions. LVH (Left Ventricular Hypertrophy) — produces an increase in leftward and posterior forces. When marked — these leftward and posterior forces may totally predominate over initial rightward and anterior forces seen in leads V1,V2,V3. The result is reduction in r wave amplitude in anterior leads. At times — there may even be elimination of any r wave at all in V1,V2,V3. LAHB (Left Anterior HemiBlock) — The bundle of conduction fibers in the LAH (Left Anterior Hemifascicle) lies slightly in front of (anterior to) fibers in the LPH (Left Posterior Hemifascicle). As a result — block in the LAH (as occurs with LAHB) results in an initial posterior direction for electrical activity that is first conducted over the intact LPH. The result may once again be reduction in r wave amplitude in the anterior leads. COPD (Chronic Obstructive Pulmonary Disease) — Severe longstanding pulmonary disease leads to an increase in right ventricular forces. In addition — orientation of the heart’s electrical forces in 3 dimensions may be altered by the large emphysematous chest of a patient with chronic COPD. These physiologic changes may result in ECG signs of poor R wave progression; persistence of relatively deep precordial S waves in lateral chest leads; and development of an indeterminate axis in the transverse plane. In the extreme — R waves are markedly reduced in size (and may even be absent) in anterior precordial leads. We are finally up to assessment of ST-T Wave Changes. Clearly — this is a topic unto itself that requires clinical application and much practice to attain a level of comfort in your assessment. We limit presentation here to basic description of the changes we look for — with our Goal being to reinforce these principles in future installments of Basic ECG Concepts. In Basic ECG Concepts #6 — We defined the baseline from which ST segment deviation (either elevation or depression) is judged. The normal ST segment is isoelectric. It lies on the baseline — and, is neither “elevated” nor “depressed” (Figure-6). Although our preference in general is to use the PR segment baseline — the TP baseline may be selected instead. Particular features on a given tracing (such as the amount of baseline wander or the presence of PR depression) may influence our selection of which baseline to choose — or whether to combine use of PR and TP segments in a given case. Heart rate is another factor that may influence our choice of which baseline to use (PR, TP or both). For example, sinus tachycardia may shorten the PR interval, as well as reducing duration of the TP segment. Clearly — accurate determination of the true “baseline” for judging ST-T wave deviations will not always be as clear cut as it is in Figure-6. Figure-6: Overview illustration of ST-T Wave Changes. ST segment deviation (either elevation or depression) — is judged with respect to the PR Segment Baseline (green arrow in Panel A). Alternatively — the TP baseline may be used. 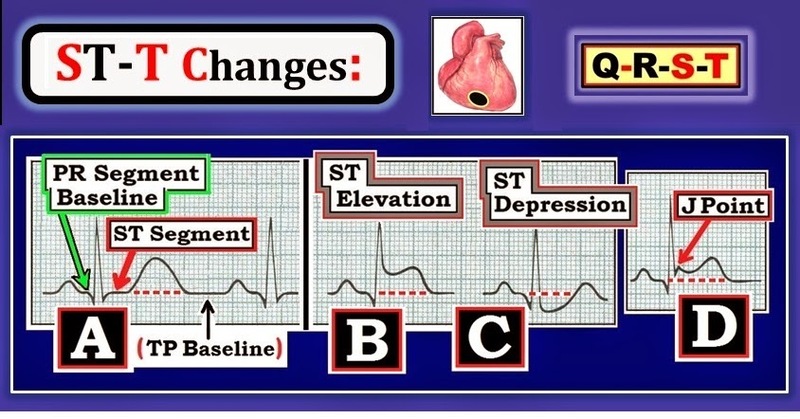 Panels B and C show several millimeters (little boxes) of ST Elevation (B) or ST Depression (C). Given how distinct boundaries between P wave, QRS complex and T wave are — it does not matter in this Figure whether one selects the PR or the TP segment as the “baseline”. Panel D shows the J-Point (defined as the point where the end of the QRS — joins the beginning of the ST segment). Note that there is at least 1mm of J-point ST elevation in Panel D. J-point notching as seen here — is very characteristic of Early Repolarization. 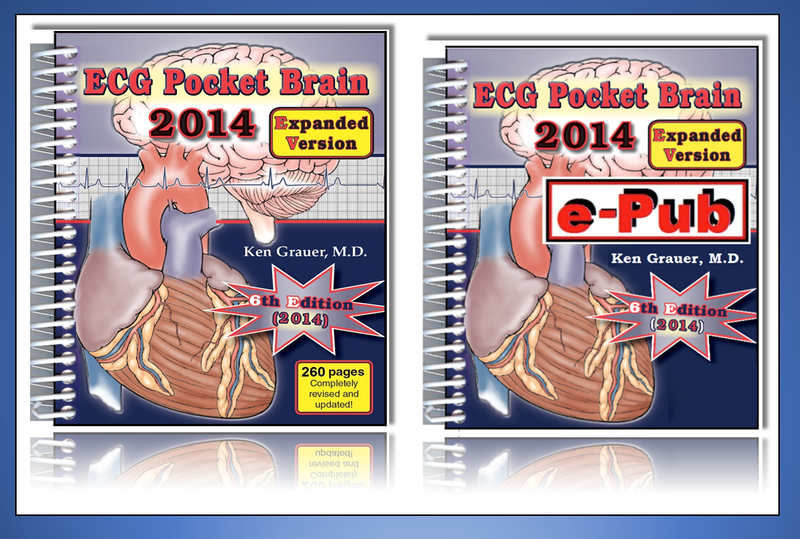 (Figure reproduced from A 1st Book on ECGs-2014-ePub). Is there ST elevation or depression? IF so — How much? How far is the J-point deviated above or below the baseline? What is the shape of any ST-T wave changes? (ie, upward concavity = “smiley”-shape — or more worrisome coved = “frowny”-shape — See Figure-7 below). What part (location) of the heart manifests ST segment deviations (elevation or depression)? — or are ST-T wave changes generalized as they might be with the diffuse ST elevation of acute pericarditis — or the diffuse ST depression of very severe coronary disease. (NOTE: The various Lead Groupings for localizing ST-T wave changes was reviewed in Basic ECG Concepts #4). About Lead aVR: For purposes of “the basics” — We do not concern ourselves with lead aVR at this point beyond our expectation that there may normally be a Q wave and/or T wave inversion in this lead. Instead — Focus your attention on the remaining 11 leads, looking at each lead for QRST changes. Optimal use of Lead aVR is an advanced topic. For those with an interest in this subject — Click HERE to download a PDF excerpted from our ECG-2014-ePUb that explores in detail various ways we use of lead aVR in ECG interpretation. Panel A (in Figure-7) — The ST-T wave is normal. That is — there is no ST segment elevation or depression. Note that there is a smooth transition between the end of the ST segment and the beginning of the T wave. In a normal ECG — the T wave will be upright in most leads that have a positive (predominantly upright) QRS complex. This will become readily apparent as we look at more ECGs. Panel B (in Figure-7) — There is a flat ST-T wave. The presence of ST-T wave flattening makes it difficult to tell where the ST segment ends and the T wave begins. This is a nonspecific change — which simply means that the ST-T wave is not “normal”, but we do not know the reason why. Panel C — There is slight ST depression. There are many possible causes of ST depression. These include ischemia — “strain” from LVH (See Figure-4 in Basic ECG Concepts #5) — electrolyte imbalance — fast heart rate — and/or noncardiac factors such as emotional stress or hyperventilation. It is because there are so many potential causes for ST-T wave flattening or depression — that clinical correlation is essential for optimal ECG interpretation. Panel D — There is asymmetric ST-T wave depression (red arrow). When QRS amplitude is increased in a patient with longstanding hypertension or heart disease — this type of asymmetric ST depression is characteristic of LV “strain” from LVH. Panel E — There is symmetric T wave inversion. In contrast to the asymmetric ST depression associated with LVH (Panel D) — the more symmetric shape of T wave inversion in Panel E (green arrow) is much more suggestive of ischemia. Panel F and Panel G — illustrate different shapes for ST elevation (See below). Figure-7: Schematic Illustration of various forms of ST elevation and depression (See text). (Figure adapted from A 1st Book on ECGs-2014-ePub). The 1st ECG change (seen in Panel 1 of Figure-8) — is coved ST elevation that develops in leads overlying the area of acute infarction. The “frowny” icon in Panel F (from Figure-7) — helps recall the worrisome shape that often indicates acute STEMI (ST Elevation Myocardial Infarction) in a patient with chest pain. In contrast — the “smiley” icon in Panel G (from Figure-7) — helps recall the upwardly concave shape that will often be benign. Q waves (seen in Panel 3 of Figure-8) — often develop in one or more leads in a given lead area after myocardial necrosis. Q waves serve as a marker that infarction has occurred. Symmetric T wave inversion (as in Panel 2) — typically indicates ischemic (but not yet irreversibly damaged) myocardium. 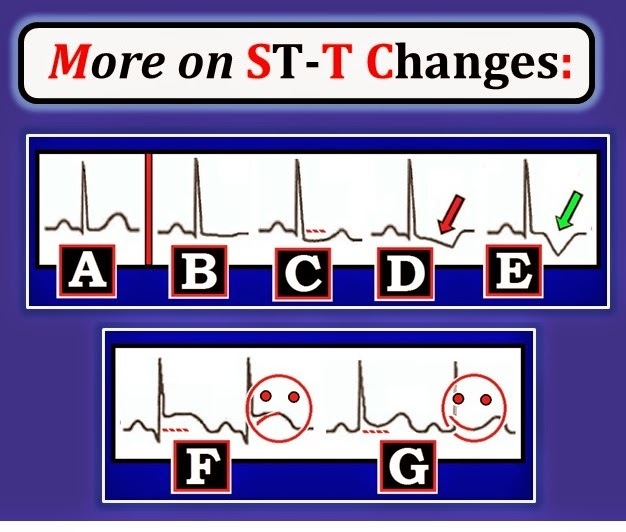 ST depression (as in Panel 4) — may be seen in leads opposite to (or away from) the area of ST elevation — in which case this ST depression is known as “reciprocal” changes. Alternatively — ST depression may simply indicate ischemia (See Clinical Notes below). 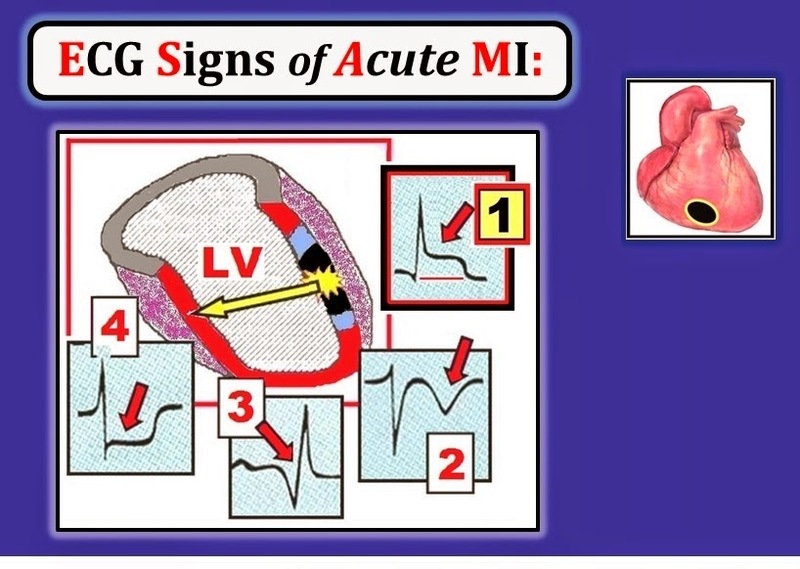 Figure-8: Schematic cross-sectional view of the LV (Left Ventricle) — illustrating the 4 ECG Signs of Acute MI. The area in black depicts the site of acute myocardial damage. Panel 1 — ST elevation (occurs in leads directly over the area of acute infarction); Panel 2 — Symmetric T wave inversion (indicates ischemia); Panel 3 — Q waves (a marker of infarction that develops with time); and Panel 4 — Reciprocal ST depression (seen in leads opposite to or away from the area of ST elevation). Alternatively — ST depression may simply indicate ischemia. (Figure adapted from A 1st Book on ECGs-2014-ePub). Not all MIs develop ST elevation and/or Q waves. Some patients only manifest T wave inversion without ever developing Q waves. Documentation that acute MI has occurred in such patients is forthcoming from: i) the History (ie, new-onset chest pain); and ii) positive blood tests for acute infarction (ie, elevation of serum troponin assays). In Theory — the ST-T wave changes in Panels 1, 2 and 4 of Figure-8 resolve after the acute event is over such that only Q waves remain. As emphasized in our discussion in Figure-2 above — the larger and wider that Q waves are and the more leads in which they are seen — the more likely it is that such Q waves indicate infarction has taken place. Be Aware! — A number of notorious “mimics” of acute infarction exist. As mentioned earlier — there are many possible causes of ST depression in addition to ischemia. These include “strain” from LVH — electrolyte imbalance — fast heart rate — and/or noncardiac factors such as emotional stress or hyperventilation. There are also other causes of ST elevation including early repolarization patterns and acute pericarditis. BOTTOM Line: It is not always easy to determine the cause of ST-T wave abnormities. It is because there are so many potential causes of ST-T wave abnormalities — that the clinical History is so important in evaluation of each patient. SUMMARY: The KEY to use of the ECG for assessing the patient with chest pain — is to recognize acute STEMI (ST Elevation Myocardial Infarction) at the earliest opportunity. This is the group of patients who are most likely to benefit from acute reperfusion (= prompt opening of the acutely occluded coronary vessel — either by balloon angioplasty during emergency cardiac catheterization or by ‘clot-busting’ thrombolytic medication). Remember the ECG Signs in Figure-8. An acute STEMI is suggested by the following: i) a History of new-onset chest pain (usually within the past few hours); ii) worrisome ST elevation (“frowny”-shape) — in 2 or more leads in a given lead area; iii) Reciprocal ST depression in other lead areas; and iv) No more than small Q waves at the time you first see the patient (as development of large Q waves suggests that the infarction is not as recent). Remember that exceptions exist to the above generalities. Let’s apply the concepts covered thus far — with a series of Practice Tracings. Because of space constraints — interpretation of the first 5 Parameters (ie, Rate-Rhythm-Intervals-Axis-Hypertrophy) is given. We begin with the ECG in Figure-9 — obtained from a patient with new-onset chest pain. Assess the ECG in Figure-9 for Q-R-S-T Changes. In view of the history — What is your Clinical Impression? Figure-9: ECG obtained from a patient with new-onset chest pain. (Figure adapted from A 1st Book on ECGs-2014-ePub). The first 5 Parameters: The rhythm in Figure-9 is sinus — as determined by the upright P wave with fixed PR interval in lead II (blue arrow). The rate is ~75/minute. All intervals are normal. That is — the PR interval is not more than 1 large box; the QRS is not more than 1/2 large box; and the QT is not more than 1/2 the R-R interval. The Axis is normal (probably between +40-60 degrees). There is no chamber enlargement. Large Q waves are seen in each of the inferior leads (II,III,aVF) in Figure-9 — and small q waves are seen in leads V5,V6. Transition is normal (the R wave becomes taller than the S wave is deep between lead V3-to-V4). The most remarkable findings on this tracing relate to the ST-T Wave Changes. There is: i) ST elevation in each of the 3 inferior leads (II,III,aVF); and ii) ST depression in other leads on the tracing (I,aVL; V2,V3,V4) with flat ST segments in leads V5,V6. Acute Inferior STEMI (since the leads showing ST elevation are the 3 inferior leads). We would urge immediate clinical correlation — as this patient appears to be an excellent candidate for acute reperfusion. There is ST elevation in each of the inferior leads (Note ST segments are clearly elevated above the PR segment baseline — as seen within the red ovals in Figure-9). In addition — the inferior T wave in lead III looks peaked, which suggests a “hyperacute” change. There are Q waves in each of the inferior leads. There is “reciprocal” ST depression in other leads (including leads I,aVL; V2,V3,V4) The finding of ST-T wave depression in leads away from the lead area showing ST elevation (leads II,III,aVF) — strongly supports our impression that inferior ST elevation in this tracing is acute in this patient with new-onset chest pain. Beyond-the-Basics: A number of more advanced points may be made about this tracing: i) In addition to being a “reciprocal change” — ST depression in leads V2-to-V4 may also reflect acute posterior infarction; ii) The “culprit” (= acutely occluded) artery — is probably the RCA (Right Coronary Artery) — because ST elevation in lead III is clearly more than in lead II; and iii) We also suspect acute RV (Right Ventricular) infarction — because instead of similar ST depression as is seen in lead V2 — the ST segment in right-sided lead V1 is flat (presumably because ST elevation in right-sided lead V1 from acute RV MI has cancelled out some of the ST depression we expected to see in lead V1 from the posterior MI). Final Point: Be aware that fairly large Q waves are already present on this tracing! This finding puts the “age” of this STEMI in some question — since it usually takes at least a little bit of time for infarction Q waves to develop. That said — because the history is of “new-onset” chest pain and other ECG changes look acute — this patient may still benefit from acute reperfusion. TEST YOURSELF: Is there an Acute STEMI? Interpret the ECG in Figure-10 — obtained from a patient with new-onset chest pain. Assess the ECG in Figure-10 for Q-R-S-T Changes. Figure-10: ECG obtained from a patient with new-onset chest pain. (Figure adapted from A 1st Book on ECGs-2014). The first 5 Parameters: The rhythm in Figure-10 is sinus — as again determined by the upright P wave with fixed PR interval in lead II (green arrow). The rate is ~60/minute. All intervals are normal. The Axis is normal (probably between +60-85 degrees). There is no chamber enlargement. No Q waves are seen. Transition is normal (the R wave becomes taller than the S wave is deep between lead V2-to-V3). The most remarkable finding on this tracing relates to dramatic ST elevation that begins in lead V1 — and extends across all 6 of the chest leads. 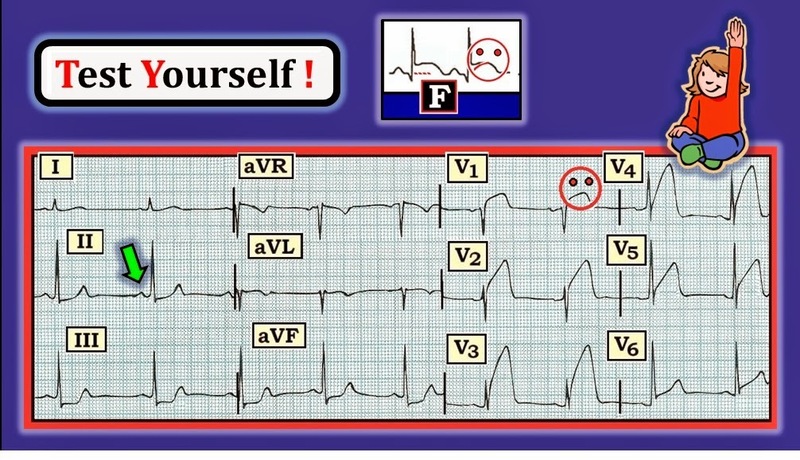 ST elevation is coved in appearance (“frowny”-shape) — and is most marked in leads V2-thru-V4. In addition — there is reciprocal ST depression in the inferior leads (II,III,aVF). Extensive and Acute Antero-Lateral STEMI. We would urge immediate clinical correlation — as this patient appears to be an excellent candidate for acute reperfusion. Further precision regarding how “old” this infarct is — might be obtained simply by asking the patient, “WHEN did your chest pain begin? The sooner the “culprit” artery (that is acutely blocked by clot) can be reperfused (ie, opened to restore blood flow to the heart — either by balloon angioplasty or ‘clot-busting’ thrombolytic medication) — the better the outcome. This is why it is so important to identify acute STEMIs like the one shown in Figure-10 at an early point in the process. As discussed in Basic ECG Concepts #4 — the anatomic areas of the heart that appear to be most involved in Figure-10 are: i) the Septum (ST elevation in leads V1,V2); ii) the Anterior wall (ST elevation in leads V2-thru-V4); and iii) the Lateral wall (ST elevation in leads V4-thru-V6). We can summarize this involvement by saying the STEMI is either an extensive anterolateral stemi or an antero-septal-lateral stemi. Beyond-the-Basics: Several more advanced points may be made about this tracing: i) Reciprocal ST depression is seen in the inferior leads. That said — reciprocal ST depression is not always seen with every acute anterior MI; ii) The “culprit” (= acutely occluded) artery — is probably the LAD (Left Anterior Descending) coronary artery — because of the anterior lead area of maximal ST elevation; iii) We can go one step further in suspecting a proximal LAD occlusion because of marked ST elevation in lead V1 and reciprocal ST depression in the inferior leads (whereas mid- or distal LAD occlusions typically show neither of those findings); and iv) Left-main disease is less likely in Figure-10 because there is marked ST elevation in lead V1 but no ST elevation in lead aVR (whereas severe left-main disease typically manifests ST elevation in aVR with a lesser amount [if any] of ST elevation in lead V1). TEST YOURSELF: Acute MI vs Early Repolarization? Interpret the ECG in Figure-11 — obtained from an asymptomatic young adult in for a routine pre-employment exam. Assess the ECG in Figure-11 for Q-R-S-T Changes. Figure-11: ECG obtained from an asymptomatic young adult in for a routine pre-employment exam. (Figure adapted from A 1st Book on ECGs-2014). The first 5 Parameters: The rhythm in Figure-11 is sinus — as determined by the upright P wave with fixed PR interval in lead II (red arrow). The rate is ~60/minute. All intervals are normal. The Axis is normal (close to +60 degrees). Voltage criteria for LVH would be met IF the patient was ≥35 years old. Small and narrow q waves are seen in leads V5,V6. The most remarkable finding on this tracing relates to J-point concave up (ie, “smiley”-shape) ST elevation that is present in multiple leads — including leads I, II and V3-thru-V6. The amount of ST elevation in these leads is considerable — attaining at least 3 mm in lead V5. There is no reciprocal ST depression. Upward sloping ST elevation in multiple leads that probably reflects ERP (Early Repolarization Pattern). The q waves that are seen in leads V5,V6 are small and narrow (ie, they are most probably normal septal q waves that are commonly seen in one or more lateral leads). ST elevation is “smiley” shape (which is common and often a benign finding when it occurs in otherwise healthy young adults). In addition to the upward-concavity (smiley) shape of elevated ST segments in Figure-11 — J-point notching is seen in several leads (blue arrows in V5,V6 — and also in leads II, aVF, V3,V4). This J-point notching (previously shown in Panel D of Figure-6 above) — is highly characteristic of a benign repolarization pattern. There is no reciprocal ST depression in Figure-11. 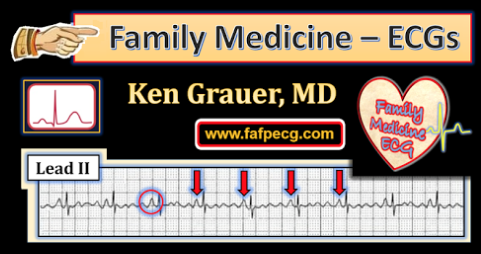 Beyond-the-Basics: Knowing the History is essential for interpreting the ECG in Figure-11. As emphasized at the end of our discussion in Basic ECG Concepts #6 — this identical ECG might be interpreted very differently IF the history suggested either pericarditis or an acute coronary syndrome. It is primarily because we are told this patient is an asymptomatic young adult that we can confidently interpret this tracing as representing ERP. 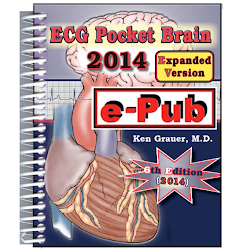 For more detailed Review of Early Repolarization Pattern — See Sections 09.14-thru-09.24 in this pdf from ECG-2014-ePub. TEST YOURSELF: Ischemia/Acute MI or LV “Strain”? Interpret the ECG in Figure-12 — obtained from a 60-year old man with longstanding hypertension. He has been having chest pain. 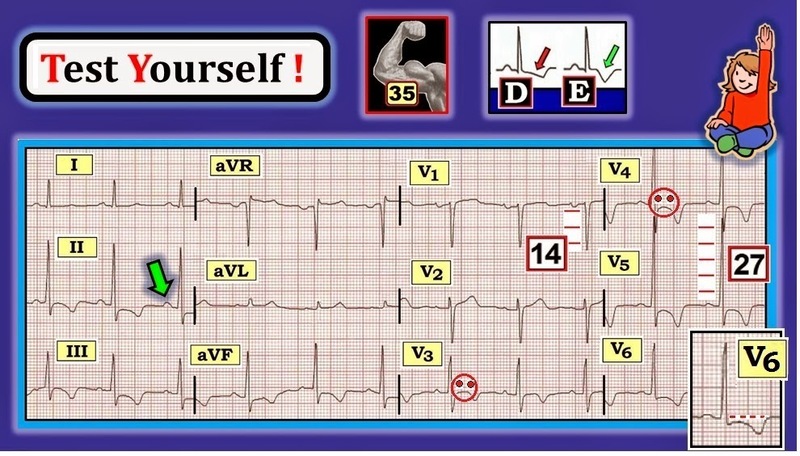 Assess the ECG in Figure-12 for Q-R-S-T Changes. Figure-12: ECG obtained from a 60-year old man with a history of hypertension. He is having chest pain. (Figure adapted from A 1st Book on ECGs-2014). The first 5 Parameters: The rhythm in Figure-12 is sinus — as determined by the upright P wave with fixed PR interval in lead II (green arrow). The rate is ~70/minute. All intervals are normal. The Axis is normal (close to +50 degrees). Voltage criteria for LVH are definitely satisfied (Sum of deepest S in V1,V2 + tallest R in V5,V6 is clearly >35 mm). No Q waves (other than in lead aVR — which is allowed). We believe there is a tiny-but-real initial positive deflection (r wave) in lead V1 of Figure-12. Even if an initial small r wave was not present — an isolated QS in lead V1 is common and not by itself abnormal. Transition is normal (occurs between V2-to-V3). The most remarkable finding in Figure-12 is deep symmetric T wave inversion in multiple leads (ie, leads II,III,aVF; and V3-thru-V6). The shape of these ST-T waves closely resembles the symmetric T inversion from Panel E in Figure-7 (especially in leads V3,V4,V5). This should be distinguished from the asymmetric ST-T wave depression of Panel D in Figure-7, that is more characteristic of LV “strain”. As a subtle point — the ST-T wave in lead V6 of Figure-12 looks intermediate between the picture of Panel D vs Panel E (See blow-up insert for lead V6). Regarding ST-T Wave Changes — it is likely that both LV “strain” and ischemia are present in this patient with hypertension and chest pain. Additional NOTES on Figure-12: There are several important points to make about our interpretation of this tracing. FIRST — We are happy IF you simply recognized sinus rhythm — LVH — and symmetric T wave inversion in multiple leads suggesting ischemia. These are the KEY findings on this tracing. The ECG in Figure-12 is not suggestive of an acute STEMI. This is because there is no ST elevation (ie, the “ST” and “E” in STEMI stand for ST Elevation). On the other hand — symmetric T wave inversion (as is seen in multiple leads in this tracing) does suggest ischemia. This may or may not be acute. That said — acute infarction may occur without ST elevation (called a “Non-STEMI” = Non-ST-Elevation Myocardial Infarction). IF the clinical history of “chest pain” was suggestive of ACS (Acute Coronary Syndrome) — then other tests (ie, blood troponin assays) would be needed to determine if a Non-STEMI had occurred. As already emphasized — the importance of recognizing an acute STEMI at the earliest possible moment — is that this type of infarction is almost always caused by acute occlusion of a major coronary artery — and, outcome may be improved by acute reperfusion of the “culprit” (= acutely occluded) artery. Even IF troponins are positive (indicating that some “death” of myocardial tissue has occurred) — acute reperfusion is unlikely to improve outcome in patients whose symptoms are controlled and who do not have ST elevation on their ECG. These patients without ST elevation generally do not need prompt cardiac catheterization. Beyond-the-Basics: Note in Figure-12 that in addition to ST-T wave depression — the J-point is also depressed below the PR segment baseline in several leads (highlighted in the lead V6 blow-up). There is also some “coving” of the ST segment in a number of leads (See “frowny” figures in V3,V4). These 2 additional findings further support our suspicion of ischemia as well as LV “strain” from LVH. Clinical correlation will be needed to know how best to proceed. FINAL COMMENT: A LOT of material has been covered in this Basic ECG Concepts #7. Routine use of a sequential Systematic Approach with special attention devoted to assessing Q-R-S-T Changes should yield dividends in picking almost all key findings that you'll see on an ECG. As practice and review — Consider redoing your interpretation of Figures 9-thru-12 in this Blog post. 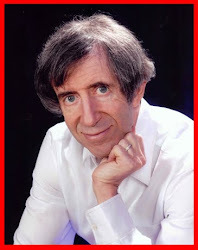 NOTE: We have made a 65-minute ECG Video on use of the Systematic Approach to ECG Interpretation — AND — Assessing for QRST Changes (www.QRSTecg.com). 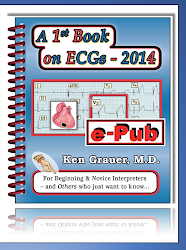 NOTE: Material and Figures #1-thru-4 and 6-thru-12 have been excerpted from our newest publication = “A 1st Book on ECGs-2014” and/or from the expanded 1st Book ePub version (available in kindle-kobo-nook-ibooks). 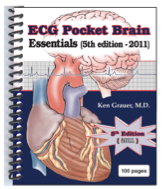 More advanced material and Figure #5 have been excerpted from ECG-2014-Pocket Brain and/or from the expanded ECG-2014 ePub version (available in kindle-kobo-nook-ibooks).